Application Fields: metal and nonmetal mine, cement, sand and stone, metallurgy. Applied Material: iron ore, nonferrous metal ore, granite, limestone, quartzite, sandstone, cobble. GC Series Gyratory Crusher is a new generation primary crushing and continuous operation equipment for the ultra-large mining and quarrying project. 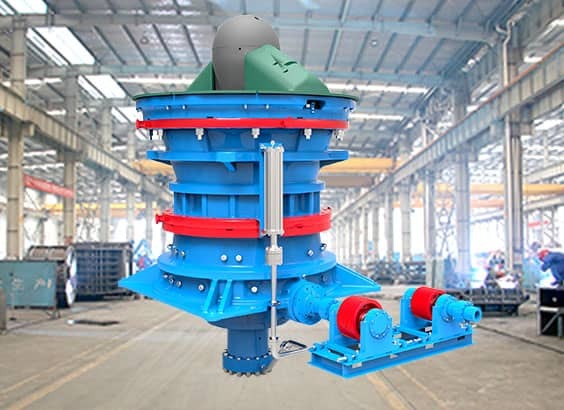 The machine adopts the alloy cast-steel heavy frame, alloy forging shaft and arc-shaped gear transmission, as well as hydraulic adjustment discharge opening, which is widely used in primary crushing for various of minerals and rocks such as mining, water and electricity, metallurgy, building and etc. 1. The special deep-cavity crushing chamber and longer feed opening designed, which make the feeding smoothly and realize the continuous crushing. Large throughput, high-efficiency crushing, big crushing ratio, superior product shape and easy maintenance, as well as less liner wear and low operation cost. 2. The main shaft can be easily adjusted by its positioning control system to make up for the liners wear so that controlling the product shape. 3. The balance cylinder system can prevent main shaft runout. This system can make the main shaft falling automatically under overloading, which avoid the main shaft runout impacting on the equipment when the large block of materials entered into the machine, to ensure the safe and stable running. 4. Equipped with pressure dust control system can effectively prevent dust from entering into the eccentricity device and transmission device of equipment, which can extend the service life of the bearings. 5. The high-strength extra-heavy frame, integral large main shaft assembly and high-performance bearings, which can ensure the service life of machine is more longer, the operation is more safe and reliable under kinds of bad working conditions. Remark: The above capacities are based on an assumed feed where 100% of the feed passes 80% of the feed opening. 80% of the feed passes 50% of the feed opening, and 30% of the feed passes a sieve size that is 10% the feed opening. The capacities are for feed materials with a bulk density of 1.6t/m³. All capacities are calculated at a maximum throw for respective machine.